In today’s ever-changing social media landscape, it is increasingly difficult to effectively reach high school students who are beginning their college search. In addition to traditional methods – phone, mail and email – many colleges create multiple Facebook pages and Twitter handles to reach students, though the reception can sometimes be lukewarm at best. Are colleges creating content that is viewed as a welcome interruption in a student’s daily social feed? Milwaukee School of Engineering (MSOE) wasn’t so sure, so they decided to create their own platform for interacting with students as part of their admissions process. MSOE, in partnership with 7Summits, created Bridge – an enterprise social network platform for prospective students – and promoted the new site using Web keys, a product that automatically takes students to the Bridge URL. Bridge is unique because it encompasses the entire admissions process and student life cycle; whereas many other colleges have developed individual sites for admitted students, alumni, and other interest groups. According to a Media Post Blog, The Social Graf, other colleges in addition to MSOE are taking note of the success of closed social communities, such as the University of Texas with their own HornsLink site, and Northwestern University. Launched in October, 2011, Bridge is an online community for prospective students, who can create their own account (using a unique login, or current Facebook credentials) to interact with their admissions counselor, complete an application, view application status, and earn badges for completing certain tasks. Beyond the private admissions area, students can interact with admissions staff, other prospective students, current MSOE students, and faculty in a public community space. This is an ideal space to learn about areas of study, build community, ask questions, engage fellow students, or meet class- and roommates – all in a user-friendly environment. “Today’s students communicate differently than those of the past. They want the admissions process to be more interactive and convenient. With Bridge, they have the ability to ask questions when they come to mind. Students and parents are able to interact with advisors and current students at their convenience,” said James Davidson, Vice President of Digital Strategy at 7Summits, the Milwaukee company that developed Bridge and was featured in a recent Milwaukee Business Journal article. 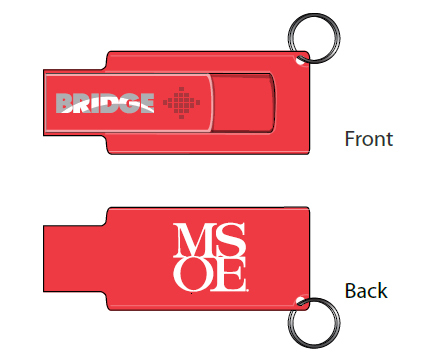 MSOE promoted Bridge through their traditional communication channels: website, press release, and print, in addition to giving away promotional Web Keys at college fairs, high school visits, open-house and other trade events. The web keys took students directly to the Bridge URL, making it easy for students to connect with MSOE Admissions. To date Bridge has over 7,000 users, according to Davidson in an EduWeb conference presentation. Bridge helped MSOE attain application and acceptance goals well before their targeted date. Moreover, Bridge has attracted national attention and awards for MSOE, as it was named one of the Ten Most Innovative Colleges by Online Universities.com in February 2012. Anecdotally, Dana Grennier, MSOE Director of Digital Marketing shared that Bridge has, “improved the quality of applicants,” while streamlining the admission process for students and admissions counselors alike. As a result of its ongoing success, Bridge will be further expanded to additional audiences with tailored content for adult students, current students, alumni, and business partners. According to Grennier, Bridge is the only collegiate site nationwide that spans the entire student life cycle, making it a convenient, one-stop resource for all MSOE target audiences. An inexpensive solution to flash drives, web keys launch a specific pre-programmed URL when plugged into a USB port. Web keys are more effective and efficient at directing web traffic than a promotional item that simply lists a URL since students would not need to remember or re-type the address. When passed along to others, web keys can reach additional prospective students. MSOE first learned about web keys from one of our direct mail pieces that included a sample. The web key solution for MSOE was truly an example of making promotional marketing work for supporting admissions goals.